Osteoid osteoma (OO) of distal fibula is extremely rare, and only few cases are reported in the literature. We report a case of OO of distal fibula and its surgical management at our tertiary care hospital. OO is typically small lesions, 1.5–2 cm in size, fairly common in long bones with 50%–60% of cases occurring in proximal femur and mid-diaphysis of tibia. The second-most common site is the spine accounting for 7%–20% of cases with predominance in posterior elements. There have been reports of OO occurring in almost all bones including cranium and face. 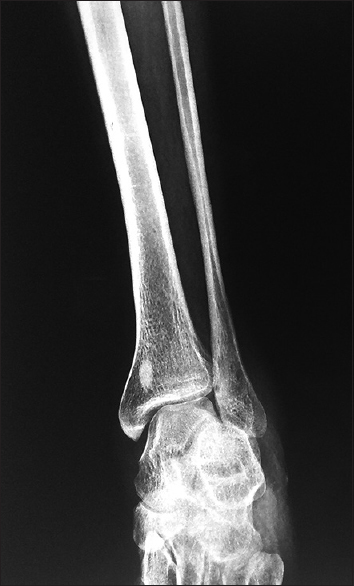 The distal fibula is very uncommon site, and to our knowledge, only one case has been reported earlier. In distal fibula OO, the patient generally presents with ankle pain, swelling, and difficulty in walking not relieved by ordinary analgesics. We here report a case of OO of distal fibula diagnosed with the help of plain radiography, computed tomography (CT) scan, bone single photon emission CT-CT (SPECT-CT), and further managed. A 38-year-old male patient, businessman by profession, presented to the outpatient department with a chief complaint of diffuse and continuous pain in the left ankle and difficulty in walking since the past 6 months. The pain was more on lateral aspect of ankle and more in the night time. There was no history of trauma, fever, loss of weight, and loss of appetite. He was taking tablet aspirin orally as when required, which helped him to get relief from pain. On examination, there was local tenderness and mild swelling at the anterolateral aspect of ankle. Ankle movement was full with dorsiflexion terminally painful. On radiological examination, X-ray showed osteosclerotic lesion around a central lucent area suspicious of OO with nidus in the medial aspect of distal fibula at the level of ankle joint [Figure 1]. 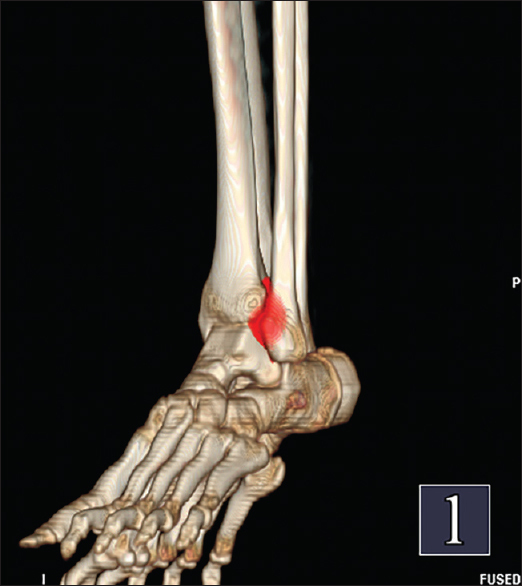 CT scan showed the nidus with surrounding reactive sclerosis in the left distal fibula [Figure 2]. Three phase bone scan and SPECT-CT using Technetium-99m (Tc-99m) methylene diphosphonate were also done. Three phase bone scan showed increased tracer accumulation in the left ankle joint [Figure 3]. However, the increased tracer uptake was diffuse heterogeneous in pattern and was not specific to OO. 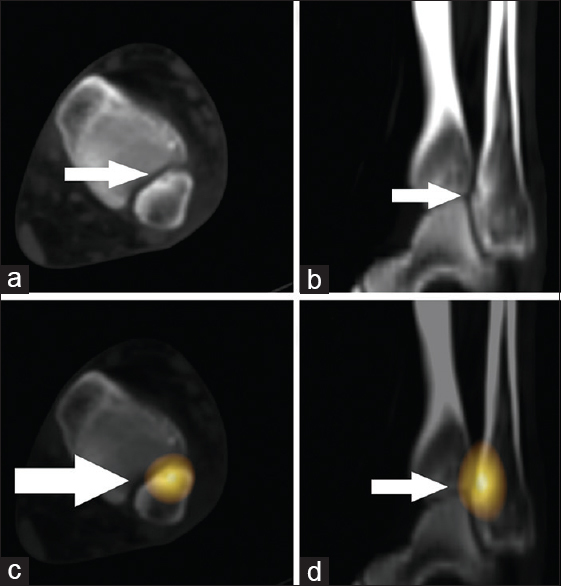 Therefore, SPECT-CT was performed, which localizes most focal uptake to a sclerotic lesion with central nidus in the left distal fibula anteromedially [Figure 4] and [Figure 5]. The lower grade diffuse uptake localized to the ankle joint, likely due to articular changes because of pain. This confirmed the diagnosis of OO in the left distal fibula. We decided to perform an open procedure using anterolateral approach to excise the lesion along with the reactive bone, sparing the syndesmosis, and articular cartilage. The patient was placed in supine position with a sandbag under the affected side buttock under regional anesthesia with pneumatic tourniquet at the thigh. A longitudinal incision of 5 cm was given at the anterior border of fibula the ankle joint, and distal fibula was exposed. The nidus location was identified by reactive cortical bone area of about 0.5 cm × 0.5 cm and further confirmed by fluoroscopy. The lesion was excised and sent for histopathology study. Adequate care was taken to prevent injury to syndesmosis joint and articular cartilage of fibula. Postoperatively, the patient was comfortable, and the earlier specific type of continuous pain was disappeared except for surgical site pain which was reducing gradually. The patient was advised for full weight bearing mobilization. At 2 weeks, stitches were removed, and at that time the patient was absolutely pain free. Postoperative X-ray showed complete excision the lesion. Histopathological examination confirmed the diagnosis of OO of distal fibula. The patient was followed up at 1, 3, and 6 months' postsurgery and there was no evidence of any recurrence. Patients with OO are usually younger and rarely present after 30 years of age. Approximately half of the all cases present between 10 and 20 years of age. It predominantly affects long bone and spine.,, According to a location within bone, they are further subdivided into cortical which is most common, cancellous and subperiosteal variants which may be intracapsular and subcapsular. Histologically, it is characterized by a vascular nidus of osteoid and woven bone surrounded by dense sclerotic reactive bone. The nidus has a high concentration of COX1 and COX2 enzymes which leads to high levels of prostaglandin (PGE) production particularly PGE2. PGE2 leads to pain, vasodilatation, inflammation, and reactive bone formation. The usual clinical presentation is pain which is related to PGE production. Pain predominates at night and rapidly responds to nonsteroidal anti-inflammatory drugs. Another possible explanation of pain is the rich nerve supply within the nidus similar to glomus tumor. If the tumor is intracapsular, it can mimic nonspecific arthritis/synovitis which can lead to delay in diagnosis. The diagnosis is usually made with plain X-ray, being accurate in 75% of cases. OO is characterized by a radiolucent nidus surrounded by a dense rim of sclerotic bone. This feature is typical of cortical OO, whereas cancellous and subperiosteal variants have minimal reactive bone formation and may not be clearly visible in plain radiograph. Further, the nidus is not always visible on radiographs in OO of small bones and spine. CT scan still remains the gold standard for the diagnosis of OO and it clearly defines the nidus and the sclerotic extension. Hyperintensity in T2-weighted images of magnetic resonance imaging (MRI) due to intramedullary edema may misdiagnosed an OO to a malignant/aggressive bone tumor. Hence, MRI plays a questionable role in diagnosis. Three-phase bone scan is useful when an OO is suspected, but radiography is not diagnostic or when symptoms are atypical. The typical picture in three-phase bone scan is focal increased radiotracer uptake in the OO in all three phases of scan. Three-phase bone scan has excellent sensitivity for the diagnosis of OO. However, it has limited specificity. SPECT-CT combines the metabolic and anatomical information in a single study and increases the specificity of the three-phase planar bone scan. In the present case, also the planar bone scan was not characteristic of an OO; however, SPECT-CT confirmed the diagnosis on radionuclide scan. Classic surgical en bloc resection remains the most common modality of treatment which in some studies has shown almost no recurrence but carries an inherent risk of iatrogenic fracture. CT-guided radiofrequency ablation has shown promising results with a recurrence rate of 5%–10%. Radiofrequency ablation, although a minimally invasive technique and cosmetically pleasing to the patient, carries a high risk of thermal injury to the spinal cord or neurovascular bundle when the lesion is in its proximity and hence not always feasible. Frassica FJ, Waltrip RL, Sponseller PD, Ma LD, McCarthy EF Jr. Clinicopathologic features and treatment of osteoid osteoma and osteoblastoma in children and adolescents. Orthop Clin North Am 1996;27:559-74. Dahin DC. Bone Tumors. 3rd ed. Springfield, Illinois: Charles C Thomas; 1967. Broadfoot JE, Chapman GK. The use of computed tomography in diagnosis of osteoid osteoma. Australas Radiol 1988;32:463-7. Chotel F, Franck F, Solla F, Dijoud F, Kohler R, Berard J, et al. Osteoid osteoma transformation into osteoblastoma: Fact or fiction? Orthop Traumatol Surg Res 2012;98:S98-104. Schaefer MP, Smith J. The diagnostic and therapeutic challenge of femoral head osteoid osteoma presenting as thigh pain: A case report. Arch Phys Med Rehabil 2003;84:904-5. Sinha S, Housden P. Discrete synchronous multifocal osteoid osteoma of the femur. Pediatr Radiol 2004;34:280. Radcliffe SN, Walsh HJ, Carty H. Osteoid osteoma: The difficult diagnosis. Eur J Radiol 1998;28:67-79. Kan P, Schmidt MH. Osteoid osteoma and osteoblastoma of the spine. Neurosurg Clin N Am 2008;19:65-70. Iffenecker C, Rocher P, Rabia MH, Dhina Z, Bobin S, Quillard J, et al. Osteoid osteoma of the petrous bone. Neuroradiology 1997;39:821-3. Daniele S, Merendi G, Rocchi L. Osteoid osteoma of the distal fibula: A case report of a very rare location treatment. J Bone Res 2017;5:181. Kayser F, Resnick D, Haghighi P, Pereira Edo R, Greenway G, Schweitzer M, et al. Evidence of the subperiosteal origin of osteoid osteomas in tubular bones: Analysis by CT and MR imaging. AJR Am J Roentgenol 1998;170:609-14. Jaffe HL. Osteoid osteoma: A benign osteoblastic tumor composed of osteoid and atypical bone. Arch Surg 1935;31:709-28. Mungo DV, Zhang X, O'Keefe RJ, Rosier RN, Puzas JE, Schwarz EM, et al. COX-1 and COX-2 expression in osteoid osteomas. J Orthop Res 2002;20:159-62. Makely J. Prostaglandins: A mechanism for pain mediation in osteoid osteoma. Orthop Trans 1982;6:72. Schulman L, Dorfman HD. Nerve fibers in osteoid osteoma. J Bone Joint Surg Am 1970;52:1351-6. Swee RG, McLeod RA, Beabout JW. Osteoid osteoma. Detection, diagnosis, and localization. Radiology 1979;130:117-23. Brabants K, Geens S, van Damme B. Subperiosteal juxta-articular osteoid osteoma. J Bone Joint Surg Br 1986;68:320-4. Gamba JL, Martinez S, Apple J, Harrelson JM, Nunley JA. Computed tomography of axial skeletal osteoid osteomas. AJR Am J Roentgenol 1984;142:769-72. Ehara S, Rosenthal DI, Aoki J, Fukuda K, Sugimoto H, Mizutani H, et al. 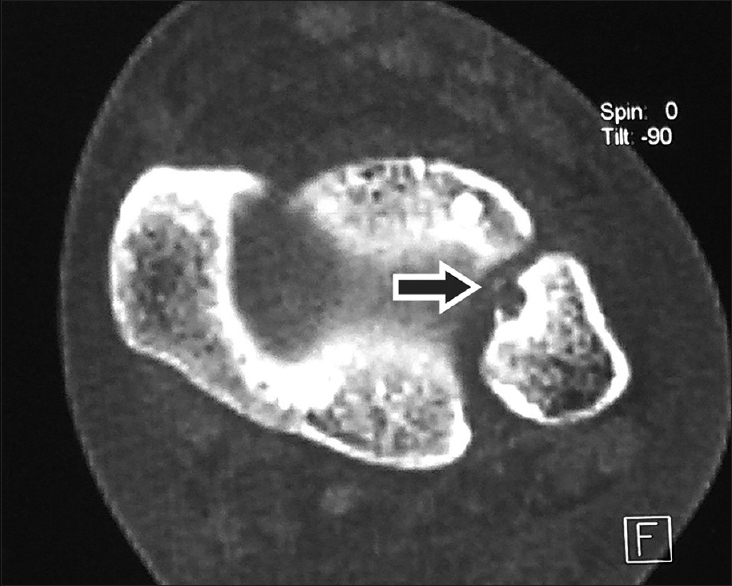 Peritumoral edema in osteoid osteoma on magnetic resonance imaging. Skeletal Radiol 1999;28:265-70. Bilchik T, Heyman S, Siegel A, Alavi A. Osteoid osteoma: The role of radionuclide bone imaging, conventional radiography and computed tomography in its management. J Nucl Med 1992;33:269-71. Sharma P, Mukherjee A, Karunanithi S, Nadarajah J, Gamanagatti S, Khan SA, et al. 99mTc-methylene diphosphonate SPECT/CT as the one-stop imaging modality for the diagnosis of osteoid osteoma. Nucl Med Commun 2014;35:876-83. Pfeiffer M, Sluga M, Windhager R, Dominkus M, Kotz R. Surgical treatment of osteoid osteoma of the extremities. Z Orthop Ihre Grenzgeb 2003;141:345-8. Venbrux AC, Montague BJ, Murphy KP, Bobonis LA, Washington SB, Soltes AP, et al. Image-guided percutaneous radiofrequency ablation for osteoid osteomas. J Vasc Interv Radiol 2003;14:375-80.